Anything You Want On A Round, Self-Inking Rubber Stamp! Custom-made, self-inking rubber stamp Model C-43 fits any need around the home or office. The Model C-43 is also available with optional centered dating mechanism (see seperate catalog page). To Your Custom Rubber Stamp. HARD COPY IN THE MAIL. NEED HELP? JUST GIVE US A CALL. 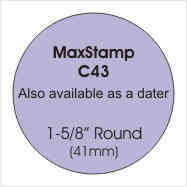 Personalizing your Self-Inking C-43 Round Rubber Stamp is easy! stamp with our Custom Post Mark design.